Hard scrubbing nylon bristles make short work of dirt, oil, gunk and grime caught deep inside bolt bodies. SPECS: Plastic handle, SS shank, nylon bristles. 10½" (26cm) overall. Fits Mauser-style including, Ruger, Rem., Win., Mk X.
Hardt skrubbe nylon børste gjøre kort prosess med smuss, olje, gunk og smuss fanget dypt inne i bolt organer. Spesifikasjoner: plast håndtak, SS skaft, nylon bust. 10½"(26cm) samlet. Passer Mauser-stil inkludert, Ruger, Rem. Win., Mk X. Tried to use this on my Remington 700 bolt and it is WAY too big to clean it. If you want to clean the inside of your bolt, find a smaller brush. Its a great tool to clean my SAA at the range during fast draw. Produsentnr. : 150934 Hardt skrubbe nylon børste gjøre kort prosess med smuss, olje, gunk og smuss fanget dypt inne i bolt organer. 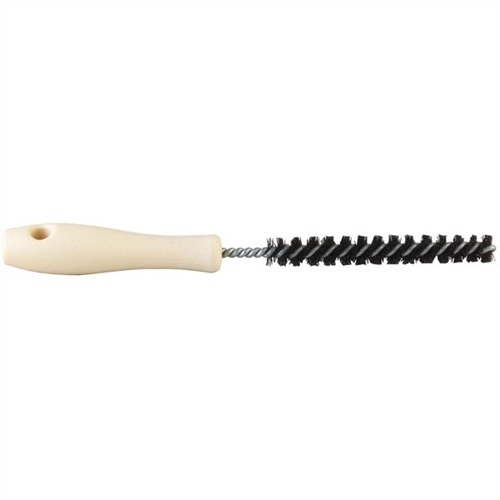 Rifle/Handgun Tornado Brush, .35/9mm Cal.